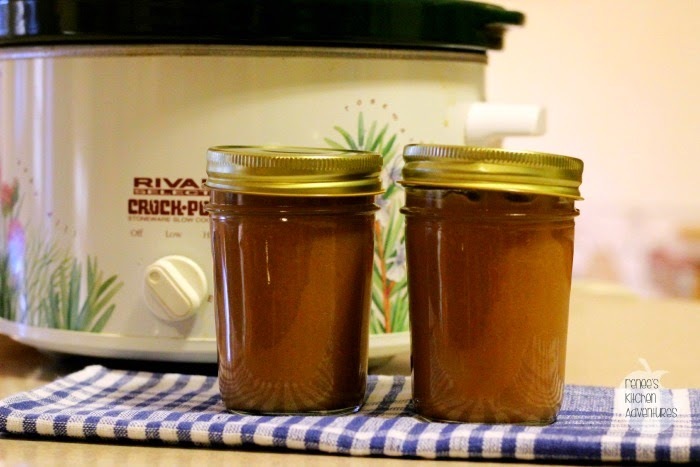 Hello Slow Cooker Spiced Pear Butter! Imagine sweet pears spiced with the warmth of ginger, cinnamon, nutmeg and allspice in a smooth "butter" that is perfect on toast and all sorts of other things! It's Fall. Everyone seems very focused on two predominant flavors of Fall...apple and pumpkin. But, I'm here to remind you about another delicious fruit that's in season now...Pears! I picked up a big box of pears last week at Costco. They looked SO good, but now that there is only 3 of us living at home, it's hard to eat that much fruit before it goes bad. 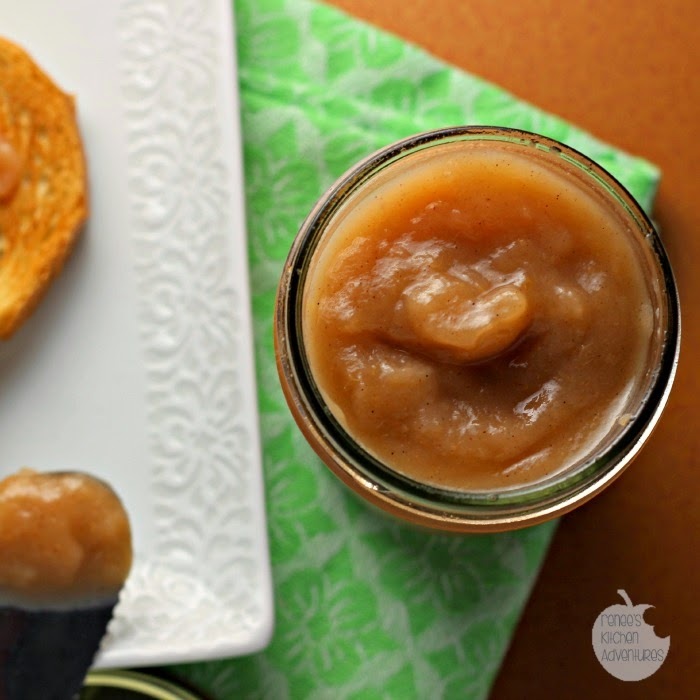 I was thinking of making some sort of pear sauce, but then I remembered a recipe I made a long time ago using apples and the slow cooker to make apple butter I had found on Skinnytaste and thought, "Pear butter? Why not!? " 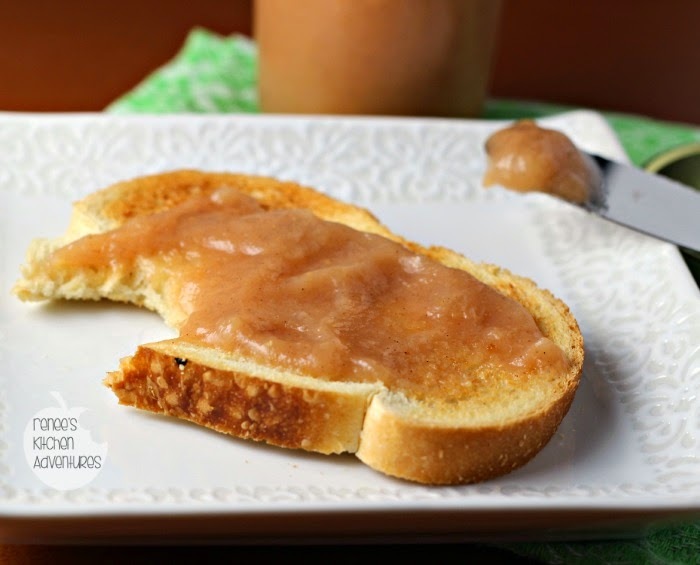 I'm so very glad I did, because this Slow Cooker Spiced Pear Butter is amazingly delicious. Imagine sweet pears spiced with ginger, cinnamon, nutmeg and allspice in a smooth "butter" that is perfect on toast and all sorts of other things! My son has already devoured an entire pint jar on his own. He's put it on toast, waffles, pancakes and in yogurt. We LOVE ginger in this house, so the flavor of ginger in this pear butter is perfect for us. While this recipe is very easy, it does require a bit of babysitting, especially in the last few hours of cooking, so you'll have to plan to be home for the tail end of the cook time at least. It won't get real dark brown, because of the addition of the lemon juice, but I love the hint of citrus in this to offset all the sweetness of the pears and the sugar. I imagine this pear butter would be awesome with pork too! I think the possibilities are endless! I didn't can my pear butter, but I think if you so desired, you could. I just ladled it into clean pint sized canning jars and stored it in the refrigerator. To be honest, this stuff is not hanging around in my fridge that long! My son keeps finding new ways to enjoy it! Slow Cooked pears and spices simmer for hours making an excellent homemade pear butter! Combine all ingredients in crock of slow cooker. Stir. Cover and cook on HIGH for 4-5 hours, or until the pears are soft and break apart easily with fork. Remove cover and puree with immersion blender until smooth. Ladle into clean jars or plastic containers and allow to cool slightly. Add lids and refrigerate until ready to use. *I'm not going to calculate nutritional information because of the option of using more or less sugar and the option of adding the butter. Pears are a great source of fiber, vitamins and potassium. They also have a good amount of natural pectin, making them a perfect choice for a thick pear butter. This stuff is some serious yum...and it used up a lot of pears! My pears were pretty sweet, so I could have reduced the sugar even less than 1/4 cup, I think. Make sure you taste your pears before you cook and you can adjust the sugar to your liking. So far, I love this stuff on toast! What will you put your pear butter on? What a delicious sounding fall recipe! I end up freezing a lot of fruit before it it's overripe, but wouldn't a jar of this pear be a great hostess gift to give during the holidays?! Looks delicious! Looks gorgeous and sounds so yummy! Grumpy loves pears so I think this would go over very well with him! Very nice recipe Renee! I love breakfast sauces in the slow cooker. I've got to try this! Oooooo... 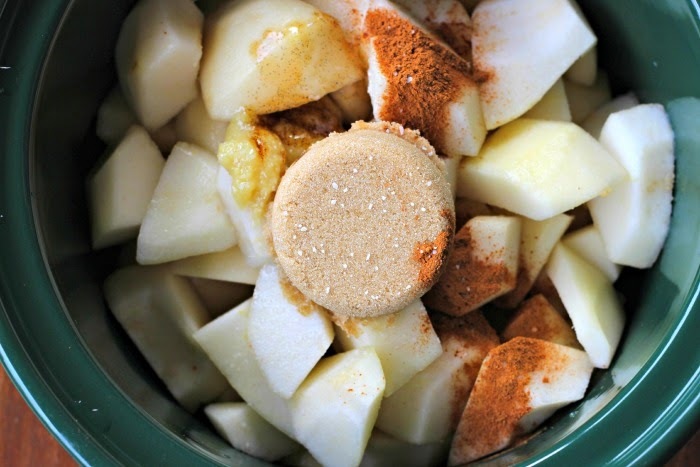 I love making pear butter in my slow cooker! I have a version of this recipe, but I add a little cardamom in there too. ;) Delicious! Such a great idea to use pears! I bet it tastes wonderful!! we used to have a seckel pear tree when I was growing up - this brings back memories! 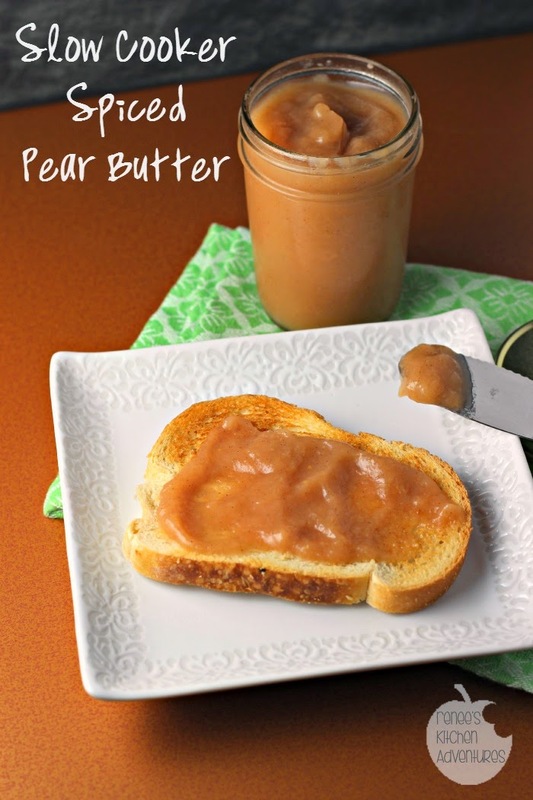 Sounds so delicious and I love the versatility of this Spiced Pear Butter. It's going to be on my Spotlight Blogger section today. What a great idea! I love pears. Pinning for later. I love ginger too - and I didn't even start cooking with it until about five years ago - I missed out for so long! This looks delicious Renee! This is one of the things I love best about shopping at Costco. I'm always looking for ways to use the things I buy. I'm totally loving the idea of pear butter. I've done apple, but never pear. Sounds wonderful! mmmmmmmmm I love this. Thank you for the ideas, I love fruit butters, and this... excellent! I am drooling over this and the endless possibilities! DIVINE!!! I like apple butter, so I have no doubt I would like such delicious looking pear butter! THANK YOU! I have been looking for a relatively simple recipe and can't seem to find the right one. You did a great job with this one--it's delicious! Thank you!!!! So glad you enjoyed this! Once you put it in the canning jars, do you do a water bath or straight to the fridge? How long will it last? I would like to give as Christmas Gifts so I want to make sure it last that long. Hi! I've only ever put it straight into the fridge, I have never done a water bath, but I think if you google how to can fruit butters, you might be able to find the information you are looking for. What size crockpot did you use? I filled my large oval crockpot with cut pears and I'm trying to calculate how much of the sugar and spices to use. I should have counted how many pears I used. Next time I guess.